It started with good intentions. I frequently do a class ‘recap’ of a reading and I wanted to encourage my students to say more, give more during this process. 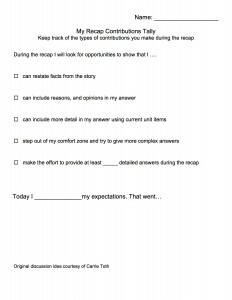 I am a big believer in letting a rubric or other such tool set & guide expectations. However finding one for this purpose had eluded me. 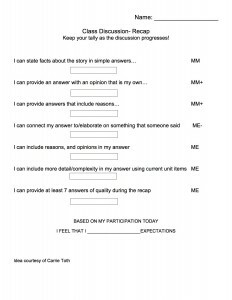 Suddenly timely posts by Carrie Toth on her independent reading yielded a class discussion participation sheet. Perfect I thought. With credit to Carrie, I took her original idea and modified it to what I wanted. By ‘what I wanted’ I mean to include descriptors of the kind of language that I expect, and know, my students are capable of producing and how they corresponded to expectations. They believe in “I can” as a motivator – It’s been a couple of years and this crop of Yr3 started in Yr1 when I started to use ‘I can’ statements on the first page of my unit book. And apparently this is making an impact. More than one group turned the ‘statement’ of what they said into a representation of what they ‘can do’. Wow. They like the sense of accomplishment and they like to be able to articulate what they are capable of. They want to challenge themselves/set their own expectations for how they will do – I’ve worked a lot on the pre-setting expectations both by me and having themselves set them and apparently they like to do this. The new sheet now starts with a ‘predictor’ or a setting of expectations but the student themselves. They want to see if they meet their own expectations – They like the ability to set a bar and rise to it. I’ve never yet seen it as an excuse for just wanting to minimally meet. They like the setting of goals and several groups wanted them to not only be able to record how many items they offered a type of answer but also to be able to ‘check’ off the category as we they went along. They want to reflect about the process after – This was my favourite. One group’s critique included a rather incredulous “What? No reflection?!! !” comment about the lack of opportunity to process the activity. So I combined this with a statement in which they get to say how well they met expectations. They know that the “That went…” starter demands both a statement about how they felt about it and, more importantly, reasons why they feel as they do. They value when they take risks in using new items they are learning – They get that to meet expectations for a unit they are going to have to show that they can understand and use current unit items. They also realize that using new items requires them to risk. I loved this “I step out of my comfort zone…” statement one group suggested. It means that they know that they have to not be content with the ‘old’ but take what they know and layer on – expand – it with the ‘new’. They don’t value a ‘points or expectation value’ on contributions – Many groups said to ‘ditch’ the expectation indicators. Some said that any contribution at all was valuable and shouldn’t be discounted for a perceived value. Others said that they ‘know’ what is expected and what ‘meeting expectations’ involves so you don’t have to have it on there. And still others said that if they delivered the majority of the tupes of contributions they know they would be meeting expectations anyway. Gone. They know that what they think/do matters – I will be presenting this updated sheet to them in the next few days. They already know that I value their choices and learning goals in the room. Now I am taking their feedback and working it into the document – and demonstrating their role/importance in the learning environment. They have voices – and they matter. After all it’s all about their learning (not my teaching). What a process – what a powerful process. I Love this Colleen! How often are students asked about their experience in school? And then made to feel like they have any agency in it? Great post!